CHENNAI: Weather-beaten bonsai trees with stout roots criss-crossing inside trays provide as much Japanese flavour as svelte Hina dolls boxed inside glass frames. Demonstrations on Koto and Judo, origami and Ikebana complete the picture, giving visitors a peek into the Japanese arts and culture. The Japanese art exhibition, ‘Passage to the future: Art from a new generation in Japan,' organised by the Consulate General of Japan at Chennai, ABK-AOTS Dosokai, and Japan Foundation, has an aesthetic display of works by 11 artists from Japan at Lalit Kala Akademi. 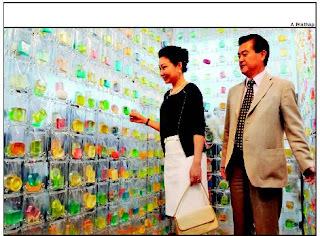 The 12-day exhibition, which got underway on Tuesday, features paintings, sculptures, photographs and video works by the artists. While a major chunk of the display are contemporary paintings, an art work done by Miyuki Yokomizo clearly stands apart from the rest. Glycerine soaps packed in tiny plastic covers are strung together to make a stunning array of multi-hued strands. The sparkly string of colours is the crowd-puller of the exhibition. An assortment of Bonsai trees, that are over 30 years old or more, take a major share of space at the exhibition. The trees that are nurtured by the ‘Bodhi – Chennai Bonsai Association' stand as evidence to years of meticulous maintenance by their owners. “Every tree needs constant wiring, pruning, grafting, clamping, watering and care. As they are tropical trees, they need a lot of sunlight,” explains K.Sivaji, president, Bodhi. The artfully sculpted trees attract a steady stream of visitors, who are also treated with a live demonstration of Judo, the Japanese martial art, and music performance on Koto, a string instrument. Elephants, peacocks, flowers, birds and cricketers came alive through folded papers at one corner of the exhibition hall. Origami, the traditional paper art of Japan, was recreated by C.Lakshmi Narayanan, who painted his pleated paper works with bright colours, adding aesthetic appeal. There will be demonstrations on origami on Wednesday and Shodo – Japanese calligraphy, on Thursday. 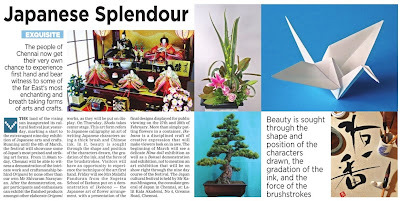 There will be an exhibition and demonstration of two different styles of Ikebana, the flower arrangement method of Japan. Demonstration on Sogetsu style of flower arrangement will be held on Friday and Ohara style follows on March 4. Hinamatsuri, the festival of Hina dolls, symbolising the health and happiness of young girls, will be on from March 1 to 3. Consul-General of Japan at Chennai Kazuo Minagawa inaugurated the exhibition. We will be putting up another 35 or so creations, so here's looking forward to the weekend! There will also be three demonstrations on the 26th. At 11 am, 3 pm and 6 pm! At Auroville - For 5 Days ay "Hall Of Light" in CREATIVITY. Its on! Until February 26th, 9 am to 12:30 and 2-5:30pm. A group of us from Chennai visited, and what a lovely day it was! And loads of laughter, camaraderie and junk food! The exhibition will be open from February 26th. There will be a small demonstration in the morning at 11 am by Sensei Molly and Sensei Meenu at 11 am. Friday, 26th February 2010 at 5.30 p.m.
Lalit Kala Akademi, #4, Greams Road, Chennai – 600 006.